Summer is here after a nice week of cool weather the forecast for the chico, CA area and most of the central valley for the coming week is HOT. High 90’s even some triple digits later in the week. This should get a few things going and slow a few things down a bit but there has been plenty of good fishing around Nor Cal. 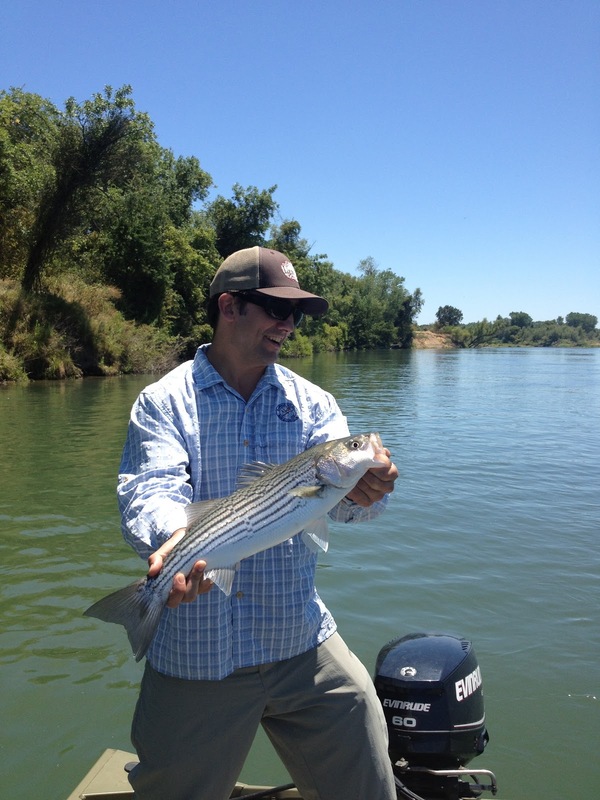 Lower Sac Stripers - Fishing is just getting going as the shad are still around in enough numbers to where stripers are not that interested in a clouser. That said we have caught some nice fish but they are few and far between. Over the next weeks striper fishing should pick up as the shad thin out. I have already seen fish moving into their normal summer haunts smashing bait or cruising. Mid July through August is going to prime time for stripers. Top Water Bass Fishing - Top water bass fishing on the river and various spots has been good. Some nice bass have been caught over the last week by my clients. Bass are in their mid summer mode and evening fishing has been good. Great time for an evening bass trip. Lower Yuba River - The nymph grab has been fair but the dry fly fishing has been good to very good depending on the day. Hopper fishing during the afternoon and evening has been getting better and better with some of the biggest fish of the day coming on hopper patterns. We have had numerous 18-19” trout taken on the surface over the last week. Caddis hatches have been sparse but there has been a few mayflies around but nothing that brings big numbers of trout to the surface. NF Feather River - is fishing good. Fishing a dry and dropper during the evening and nymphing during the day is catching the most fish. One of my buddies has been really putting the wood on some nice rainbows up through the canyon. Great place to go and get out of the heat. Hex hatch - Hex hatch is going strong up on Fall River and the Hex hatch on Lake Almanor is a bit slow to get going. LOTS of people and not a lot of bugs makes for slow fishing. Lake Fishing - Sierra Lakes are a great place to get out of the heat and catch both rainbows and brow trout. There countless great lakes that hold both planted, hold over, and wild trout for the fly angler and that I spend time guiding. Pull buggers on a sinking line during the day then look for the calibaetis, Damsel, or Hex to hatch during the evening. I still have a few dates available through August so if anyone is interested in getting to chase some stripers, bass, or trout shoot me an email or give me a call. Don’t forget to add hgb fly fishing on face book for the most up to date reports and posts.